Slate can create a lovely, modern look in your garden, enabling you to create a maintenance-free landscape that works well with plants and water features. Slate slabs can be used for a wide variety of projects, from creating a rustic looking wall to paving the perfect patio. This material is so popular, there are whole websites dedicated to slate garden design ideas. Brazilistone offer a choice of black or grey-green outdoor paving slabs, made from the finest quality Brazilian slate. Our black outdoor paving slabs are fully tested to resist the most extreme weather. Rain or shine, they’re create the most stunning look for your garden. We also have a range of mosaic floor and wall tiles, in a range of beautiful hues. 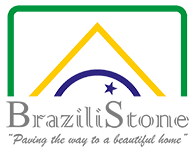 You’ll also find a huge choice of slate tiles for your kitchen or bathroom. 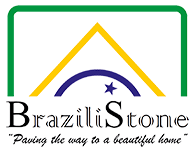 Whether you’re looking to decorate your garden or a kitchen or dining area, Brazilistone can help you find the products you need. Our show room is based in Oxfordshire and can be visited by appointment only. Read more about our slate slabs for your garden. Or get in touch with our friendly team today on 01235 848 858.